Hi guys! Happy fall, FINALLY. I am thrilled that October is finally here. I lu-uh-uhhhhve Halloween. Have I mentioned that before? Like, only every year, I know. I'm an October baby, so Halloween always felt like a second birthday for me. I prefer cute Halloween decor to creepy, gory, yucky. I'm also obsessed with black, white and gold for Halloween decor this year, so I wanted to create something new along those lines. This little Poe-inspired felt raven fit the bill perfectly! 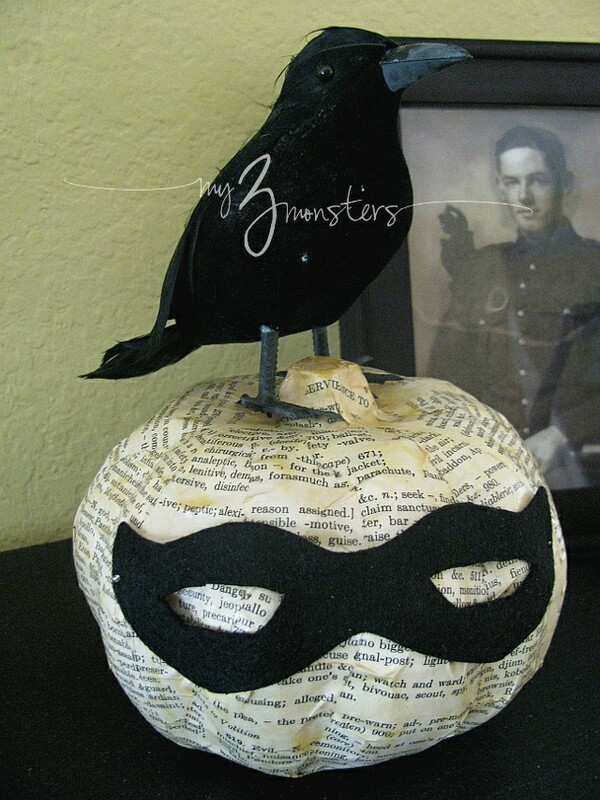 I just love the way he looks perched on my coffee table next to my vintage-looking spell books and my gilded mini pumpkins. You may have noticed this cute little raven tucked in on one of the shelves of my Witch's Bakery for Trunk-or-Treat last week, too. You can easily create this little guy in under an hour, even if you aren't much of a sew-er. It's beginner-level easy! I used a blanket stitch to hand sew all the edges, but you could whipstitch it or sew it however you are most comfortable. Don't worry about your stitches being perfect. If you use black thread on black felt, you can barely even see them at all. I think you could probably even use fabric glue or hot glue if you are really opposed to sewing! I'm just going to share some very basic steps here to give you an idea of how this project is made. The pattern download has a very detailed set of step-by-step instructions with photos that you can follow. Stitch the body pieces together around the end of the tail, leaving a part of the belly open for stuffing. Fill your bird with fiber-fill stuffing, using a pencil or other pointed object to get it down into the beak and tail. Once the bird is stuffed as much as you like, stitch the opening closed and attach the wing and tail feathers. To finish up, use small alphabet stamps or a black marker to add a message to the twill tape that will be in the bird's mouth. I chose the Poe-inspired "nevermore". Be sure to stamp your message a little off center of the length of twill tape or part of it will be hidden by the bird's beak. Feed the ribbon through the slits in the beak shown on the pattern. Paint and distress your candlestick, if desired, then use hot glue to perch the raven right on top of it. I'm kinda' in love with the way this little guy turned out! He'll be the perfect addition to my Halloween decor. I might even make a couple more on candlesticks of different lengths to create a little vignette on the top of my piano, too.